Electronic Bursting Tester This instrument is an international general (Mullen)-type apparatus, widely applied to packaging materials, mainly for the determination of Single and multi-layer cardboard and corrugated cardboard can also be used for silk, cotton and other non-paper materials, the bursting strength test. To put material only then automatically detect, automatic testing, automatic hydraulic recoil and automatic calculations, store test data, print instrument with digital display and can automatically print test results and data processing. Standards: JIS-L1004, L1018, L1031, K6328, P8131, P8112 and ASTM-D2210, TAPPI T403, ISO2759-2001, GB/T1539 The main technical parameters: Induction: Pressure Converter Instruction mode: LCD display Mode of operation: automatic (by pressing the test button and no clear peak) Power unit: kpa, psi (Lbs / in ^ 2), kgf / cm ^ 2, with unit switching function Capacity choice: high-pressure 0 ~ 100kgf/cm ^ 2 (0.1kgf/cm ^ 2) Clamping ring material: stainless steel SUS # 304 Clamping ring diameter: upper and lower clamping ring diameter φ31.5 ± 0.05mm Hydraulic oil: 85% glycerol, 15% distilled water Pressing speed: high-pressure 170 ± 10ml/min Horse Power: 1/4HP motor vibration Dimensions: (L × W × H) 430 × 530 × 520mm Weight: 64kg Power source: 1 ∮, AC220V Standard configuration: a rubber membrane, a wrench, calibration film 10, a bottle of glycerin. Skyline Instrument (HK) Co.,Ltd is a manufacturer of laboratory and sample dyeing testing equipment as well as quality control testing instruments. We have provided value added support services like lab layout, calibration testing procedures / standards, recording techniques and operations of equipment, etc. 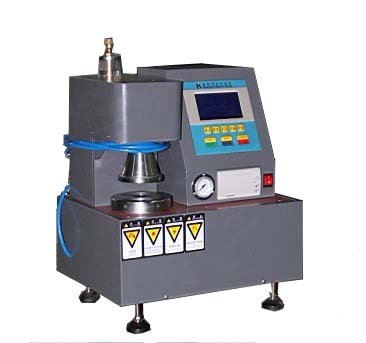 With a network of representatives providing sales and technical support world-wideSkyline Instruments has achieved good repute in the fields of textile testing equipments, toy testing equipments, furniture testing and other measurement test equipments.Skyline has been the worlds No 1 testing equipment supplier. As a global leader in testing equipments skyline’s mission is “ To provide innovative, clean and effective testing solutions for better tomorrow”.